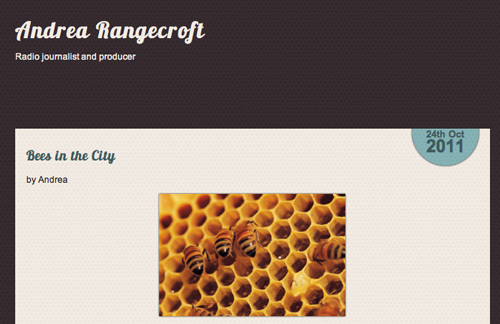 The Hive Honey Shop were asked to take part in an in depth radio interview about City Beekeeping. Andrea Rangercroft, the interviewer popped by the shop and asked James our expert beekeeper, ‘what does it take to look after bees in a city environment’. Andrea was particularly interested in the shop, how we make our honey products and the long history of beekeeping in James’s family. Every single honey bee in Britain today comes from a hive maintained by a beekeeper. Honey bees have been under threat in recent years, but the history of beekeeping stretches back thousands of years and it’s now coming to the city. Urban beekeeping is becoming increasingly popular and, as Andrea finds out in this programme, it is no longer just about making honey. In this edition of Views behind the news, Andrea visits the beehives at the Camley Street Natural Park with Alison Benjamin from Urban Bees. They discuss the history of beekeeping in London and the practicalities of keeping bees in the city without upsetting your neighbours. She also discovers the art of making honey from James Hamill, a man who comes from generations of beekeepers and now helps run The Honey Hive Shop in Battersea.